Internet fail yesterday kept me from blogging. All kinds of crazy specials and offers by the phone company here have the whole system on the point of complete saturation. Goodness knows how long it will all keep running before everything comes crashing down. Of course, the phone company tells me that everything is just “fine”. So, I couldn’t write my blog but, never mind, there is always plenty to do. Once again I was immersed in the warm woolly smells and happy colors of the highlands as I took out the beautiful bands made by the weavers in Independencia, Bolivia from their handspun yarn colored with natural dyes. You know how much I love to dress up little bags and pouches. I am cutting up the bands just as the weavers themselves are doing in Independencia to make cell phone pouches and other such things to sell. So, I have been weaving and sewing tubular bands, braiding and embellishing away and having fun. 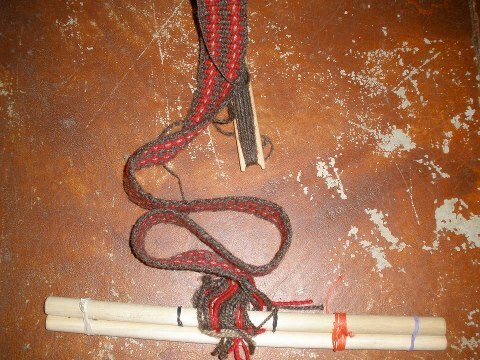 Here is one partly dressed-up pouch with a brown and red tubular band, braids and tassels. These projects give me the perfect opportunity to put into practice the many little finishing techniques that my weaving teachers and sling braiding instructor have shown me over the years. The two-color edging stitch that my sling teacher in Peru taught me for decorating the cradle section of the sling looks lovely along the edge of fabric. I have used it to edge a table runner. Now that it is not so hot here, it is really nice to feel the wool in my hands. It is also nice to have something off-loom to play with. On the loom, I have the black warp that I took on my last spring trip away. I am using the fine Guatemalan cotton which I recently wove into black and purple scarves decorated with supplementary-weft patterns. As I am still in my supplementary-weft phase, I have been thinking about what to do with this black demo warp. I created it with nothing in particular in mind…just something to show one of the ways in which a warp can be put together for backstrap weaving. Now I am thinking that since I used patterns based on Bhutanese motifs on the black scarf and Guatemalan inspired patterns on the purple one, I should base the designs on this new project on supplementary-weft patterns from another weaving culture….either Bolivian hatband motifs or the designs used by the Montagnard weavers with whom I studied in the US. I have a few hatbands that I have gathered over the years. 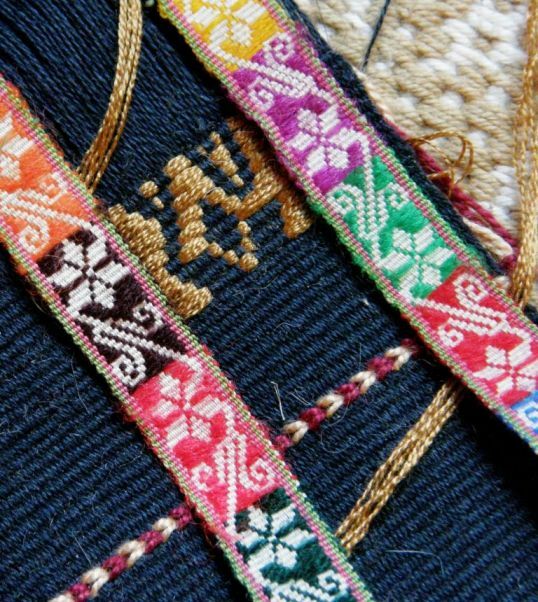 The problem with studying the motifs on these supplementary-weft patterned bands is that the thread that Bolivian weavers use for these is so incredibly FINE!! What I like about some of the Bolivian hatbands that I have seen is that the supplementary weft is used to fill the negative spaces. 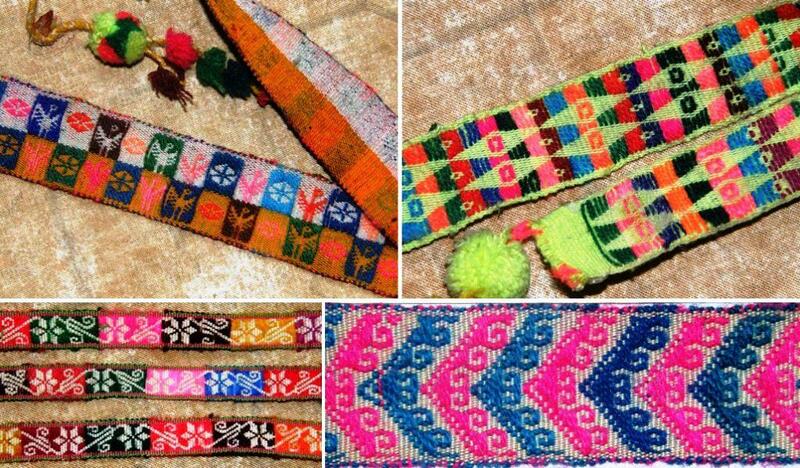 Look at the flower pattern at bottom left on the hatband from Calcha, Bolivia. The ground weave is white and the colored supplementary wefts fill the negative spaces so that the ground weave below is exposed in the shape of a flower. The thread used in that flower band is unbelievably fine….almost like strands of hair! I can’t count the threads and will need to get a magnifying glass to do so. The fineness of the thread means that the weaver has been able to get away with making some very long floats of supplementary weft. As the piece was designed to be worn around a hat, long floats are not really a problem as it is unlikely that they will catch on things and get pulled. For my sample piece I have had to modify the pattern to eliminate some of the long floats as my Guatemalan cotton, as fine as it is, is nowhere near as fine as the Bolivian thread. You can just see the top half of the flower head in my sample as I weave to check the proportions. Look at the difference in size between my sample with my “fine” cotton and the Bolivian band. I think that I will have to re-define “fine”! 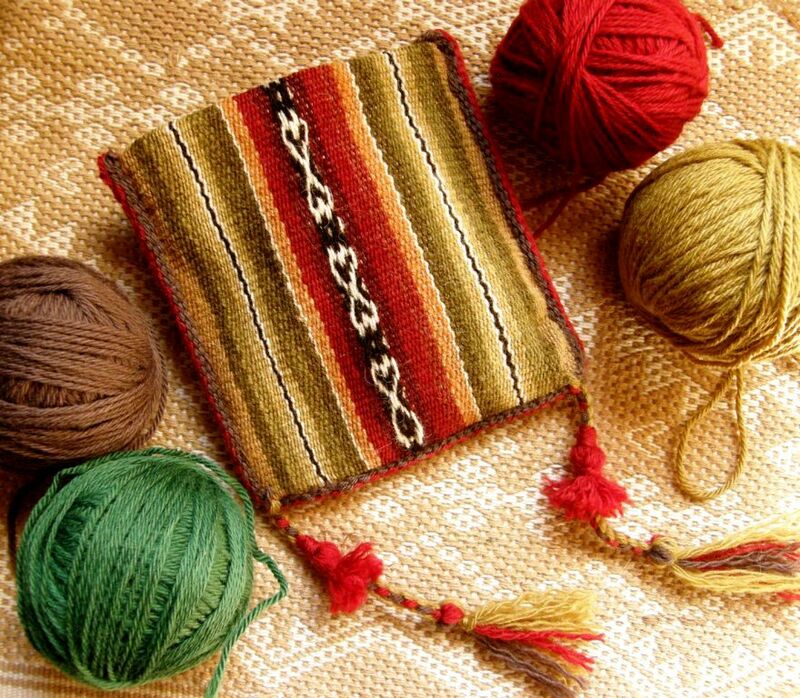 The Bolivian weaver has used a colored stripe to border the pattern so that the colored wefts don’t just end “in space”. Besides looking good, this also saves her the trouble of having to count threads to see where the wefts need to dip back down within the shed. I was trying to just eyeball it when I was doing it and found myself one warp thread off the mark many times. 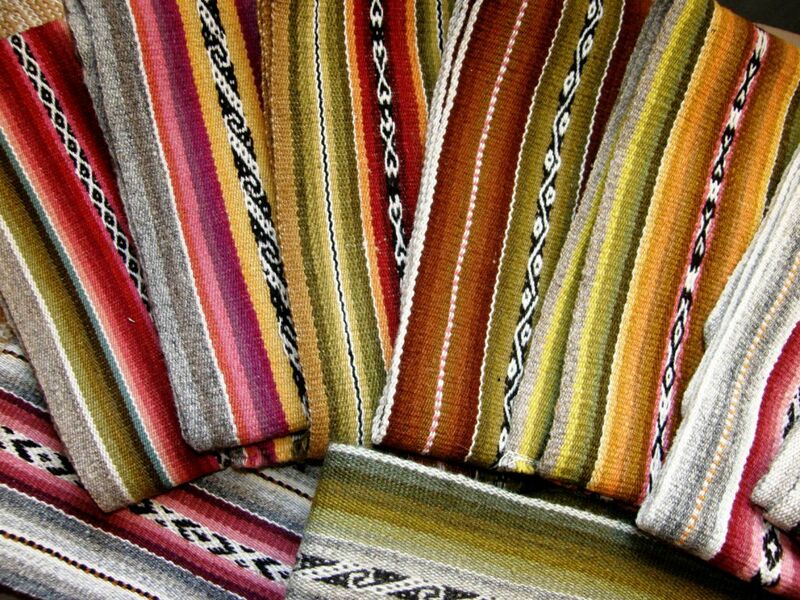 So, to weave this, I really need to make a new warp with stripes included or….maybe I can come up with another plan by doing some more sampling. Hopefully the sampling will become something acceptable and I will be able to make this little black piece into a pouch with lots of embellishments. 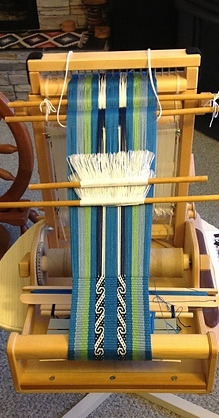 In the Ravelry group, Cindy has been doing pebble weave on a Gilmore Wave loom making what might become a backstrap. The pattern is one that my teacher Maxima taught me and is charted in my second book. Betsy is making guitar straps on her backstrap loom with her own handspun. Janet is her spinning teacher and Betsy works hard at her spinning every day, so you can imagine that her handspun is really lovely and works beautifully for backstrap weaving. Jennifer demonstrated how using a coil rod eliminated the annoying corrugated look in her cotton warp and gave a new life to this abandoned project. 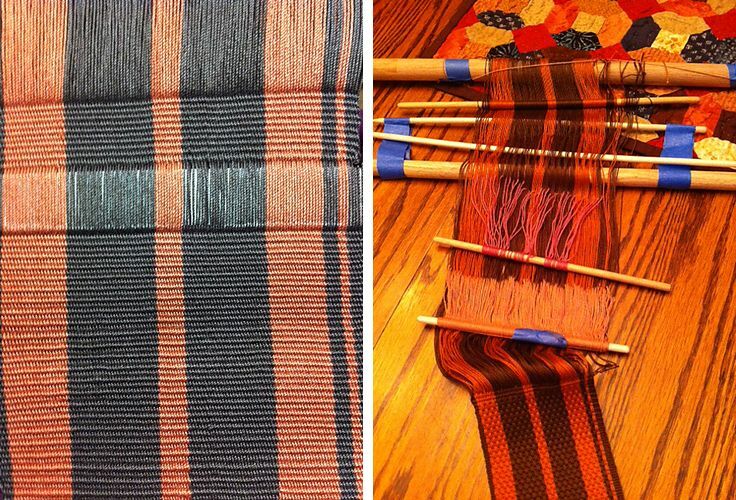 She then used the warp to create a really interesting solid-color warp-float pattern using a pattern stick and heddles to raise the warps for the floats. Well, it’s back to sampling on the cotton warp, embellishing the wool pouches and playing some more on the inklette project for the article. My internet is running again and all is “fine”. Thanks to everyone who wrote with suggestions about the embroidery stitch on the pillow cover from Peru. I think that it would make a nice cover stitch for joins and hope to experiment with it soon. 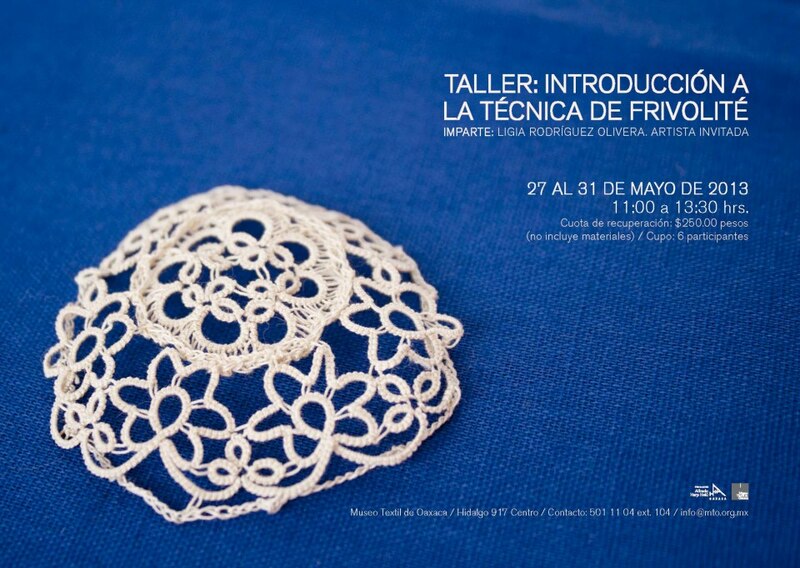 In the meantime I have also found out that the word used by Spanish speakers for tatting is frivolité….love that word!…and that a few of my online friends do it. 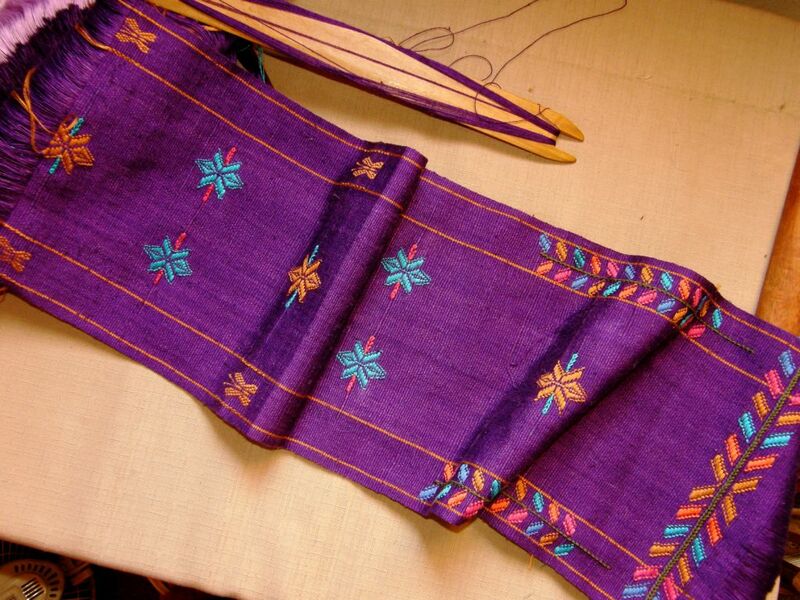 I follow the Textile Museum of Oaxaca on Facebook and they are even giving a workshop on it. Let’s see how I can add a bit of frivolité to my weaving! 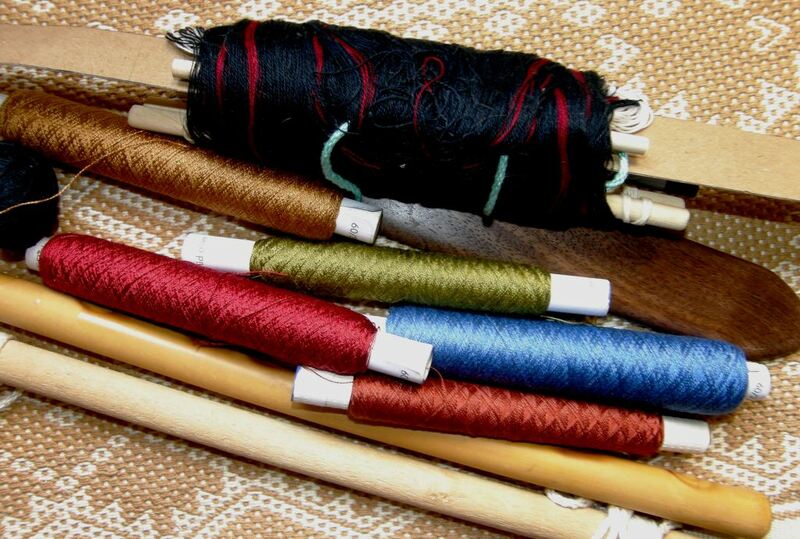 OOOooo, I can hardly wait to learn the tubular weaving so that I, too, can create some beautifully edged and decorated pieces. Can you point me to the explanation of how to use a coil rod to eliminate the corrugated look? Thanks! This has all been about weaving with cotton. On warps that are not circular, turning the warp around and weaving a few inches from the “wrong” end will lock everything into position so that when you weave from the good end you won’t experience the corrugation. However, since I started writing about this, some of the members of the Ravelry group have been putting a coil rod on non-circular warps too. Thanks, your blog is so full of information! Thanks for showing the beautiful natural dyed yarns from Bolivia. I’d love to know the plants used. Can you tell me, Laverne or recommend a reference? I highly recommend reading the PAZA blog written by ex-Peace Corps worker, Dorinda Dutcher. Dorinda works with a group of weavers in Independencia in the province of Cochabamba, Bolivia and blogs about their plant collecting and dyeing days. There is lots to explore on that blog. Here is a link to get you started….enjoy!